Our cloud-based solution gives you immediate access to CryptTalk PRO. 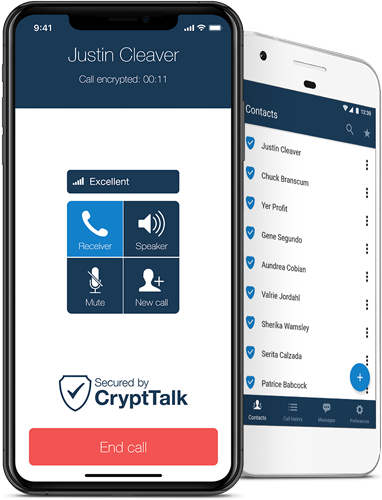 Whatever the size of your company or complexity of its organization, CryptTalk PRO's full range of secure calling and messaging features are available to your staff within minutes. CryptTalk PRO is fast and easy to configure. No special training needed. Take advantage of our annual business subscriptions with generous volume discounts. If your security policy or company strategy requires, CryptTalk PRO can also be deployed as an isolated system hosted in a private cloud. The server environment of our isolated private cloud service is protected and monitored 24/7, guaranteeing the highest availability. We operate several server clusters using reliable, professional data centers in safe locations. 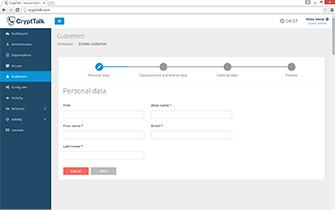 CryptTalk PRO's isolated hosted solution comes with a comprehensive User Administration Interface, which allows secure yet easy user management. Collaboration between organizations can also be centrally administered and managed by defining access and visibility rules and credentials. All user management procedures can be made compliant even with the strictest internal company policies. An on-site deployed CryptTalk PRO service is always maintained by the customer's IT staff; only they have access to the system's components and its administrative tools. CryptTalk PRO's developers have no access. Arenim Technologies cannot access any operational information (e.g. list of users, e-mail addresses). The service cannot be remotely monitored or deactivated. Credential management system with multiple admin and user levels. Organization, Group and User management. 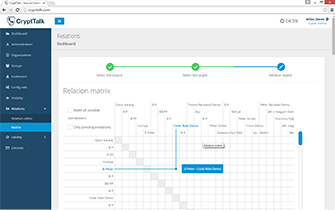 Configuration and update management (forced and recommended settings and updates) with MDM Support. Your client application and server backend can be customized to fit your particular needs. In case of any special demand please contact us. 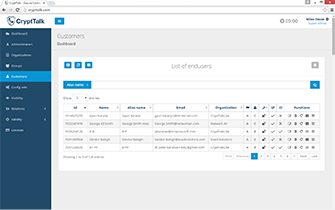 The CryptTalk PRO service is available for white labelling, including customization of the client application (e.g. using your own logo and corporate identity). We can provide flexible service plans, full service integration (including provisioning, billing and settlement systems), 24/7 second and third tier technical support. Complete the form or call us to speak directly with a sales representative.